Yesterday I was away from Monster HQ on a train expedition, so I took a minimal on-the-go crochet kit with me to make some small things. 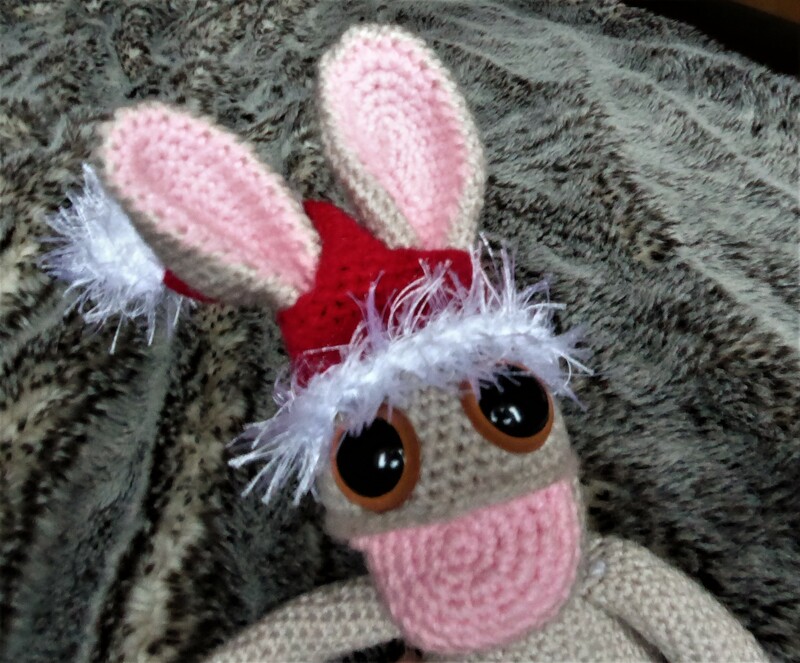 Here’s a Santa hat I made for Bananas Bunny, modelled by his friend who is a resident at Monster HQ. No, I have absolutely not been at the sherry. This took me a couple of hours. To make a cone shape, start with a magic ring of 4 or 5 stitches, and then crochet in a spiral, amigurumi-style. (UK folks, single crochet USA = double crochet UK). Increase every x stitches to get the the shape you want. For example, if you increase every 3 stitches, you’ll soon get a fat cone. If you increase every 11, you can make a long narrow one. Keep going until the end of the cone is big enough to fit the head of your model. In my hat, I started with an increase every 11 stitches, and then moved to 7 and then 5 to get it to flare out at the bottom once it was long enough. For the bobble, start with a magic ring, and use the usual pattern for amigurumi spheres. You’ll need a stitch marker for this, which can just be a piece of different colour yarn. So, the first row, you increase in every stitch, In the second row, you increase every other stitch. In the third row, you increase every 2 stitches, and so on. Once your bobble is big enough, do a row or 2 keeping the stitch count constant, and then decrease in the same pattern. When you’re down to just a few stitches, cut a long tail, use a needle to weave it in and out through the ring of stitches. Depending on the size of your bobble, you might want to add a little stuffing. 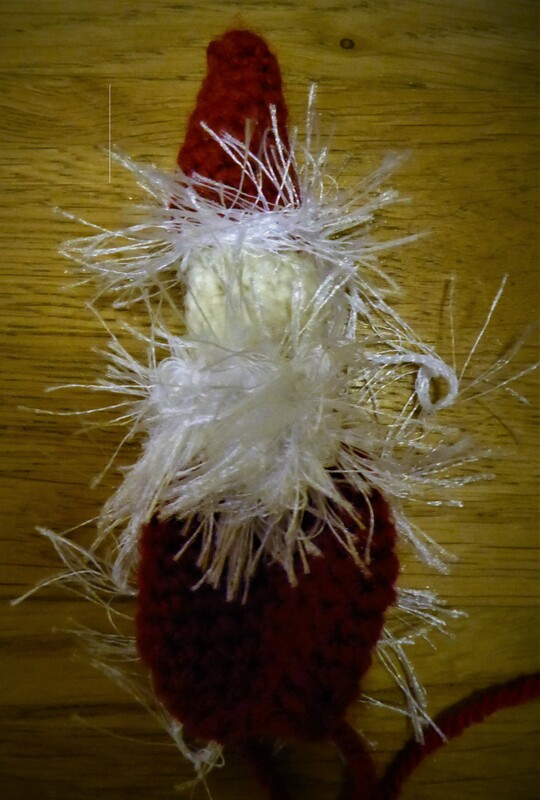 Then pull the yarn tail to gather the bobble closed, and stitch it to the hat. Crochet balls also make good Christmas baubles! Add sequins, beads, surface embroidery or crochet for extra shininess. I started this elf/gnome on the way home, but I haven’t finished him yet. I wanted to see how far I could get in one train journey. I’ll be finishing him off and giving him away as an act of random Yuletide. He needs a bit of elf improvement.